During a panel at the St. Petersburg International Economic Forum, Russian dictator Vladimir Putin claimed once more that his government did not tamper with the United States presidential election. But, he remarked, it would have been very easy to do so. NBC’s Megyn Kelly—formerly of Fox News—moderated the panel on which Putin spoke on Friday, June 2 in his hometown of St. Petersburg. As the news organization reports, Kelly told Putin that U.S. intelligence organizations have traced evidence of election hacking back to him. Prior to this panel, Putin remarked on Thursday that perhaps unaffiliated hackers might be tampering with democratic elections across the world, but still—Russia has had nothing to do with it. “We didn’t do this! Stop this!” he demanded. Later, in a one-on-one interview with Kelly—the first episode of Sunday Night With Megyn Kelly—Putin responded to America’s accusations with his own. 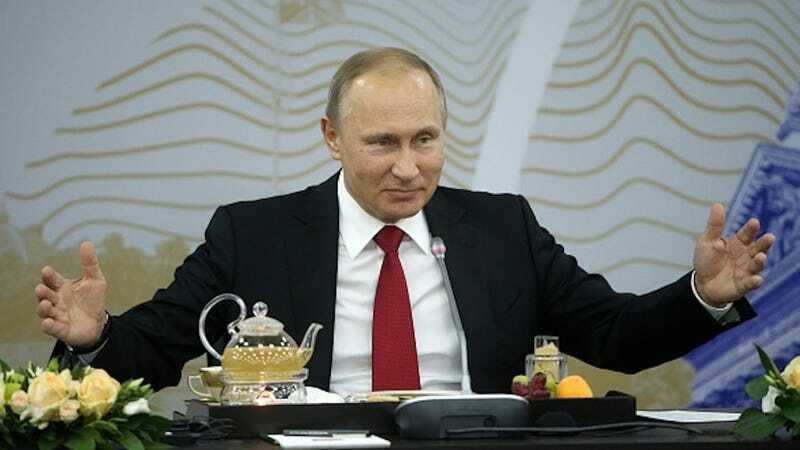 “Put your finger on a map of the world, and everywhere you will hear complaints that American officials are interfering in internal election processes,” Putin asserted. Kelly remarked that this comment sounded like a justification for his country’s own interference and put pressure on his government’s corruption. As she reminded Putin, he has a history of repressing dissent (and many suspect him of doing so in deadly ways). Putin, however, demonstrated little patience for what he regarded as moral condescension. A notorious “spin-master,” the dictator maintained a defensive stance, drawing upon classic gas-lighting tactics.